No big story here…some apricots that needed using up led me to rifle through my cookbook collection for inspiration. I found this Apricot and Cinnamon Cake in Bill Granger’s Every Day. When we lived in Sydney, visiting one of the bill’s restaurants was always a special treat, and I think he is a master of simple cakes and baked goods (and he makes the best pancakes!). This is a cinnamon-spiced cake with halves of juicy apricots baked in. A crumb topping with more cinnamon gives it a perfect morning coffee cake vibe, but if you add a scoop of ice cream, it suddenly seems more like dessert. I used small apricots, but I think peaches or nectarines would be equally delicious (if they are large, they may need to be cut into thick slices, rather than simply halved, though). This cake smells wonderful in the oven. Steph’s Notes: The cinnamon is front and center in this cake. If you’d rather have it little more subtly spiced, I’d suggest leaving the cinnamon amount as-is in the cake portion and reducing it by half in the topping. If you don’t have self-raising flour to make the cake, you can use 140 grams of all-purpose flour combined with 1 1/2 teaspoons of baking powder and 1/8 teaspoon of salt. -Preheat oven to 350°F (180°C). -To the topping, put the flour, cinnamon, sugar and pinch of salt in a bowl. Rub the butter with your fingertips until crumbs form. Chill while you assemble the rest of the cake. -Sift flour and cinnamon into a large bowl and stir in the sugar. -Make a well in the center and pour in the egg, milk, vanilla and melted butter. Mix with a wooden spoon until the batter is smooth, then spoon into the cake pan. -Arrange the apricots, cut-side up, evenly over the batter and then press gently down. Scatter the topping evenly over the apricots. -Bake for 35-40 minutes or until the cake is light golden and a skewer inserted into the middle comes out clean. Leave on a rack to cool before removing from the pan. This looks gorgeous, and seems really simple to make! 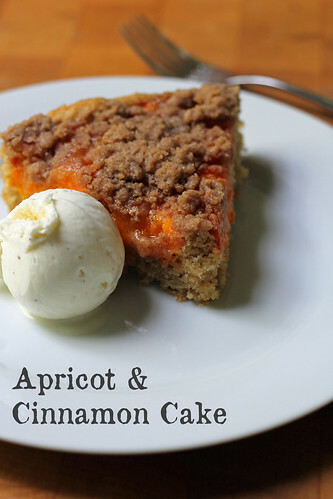 The topping on that cake and the apricots peeking through makes this irresistible. sprinkle cinnamon on ANYTHING and I will eat it. Seriously. Anything. But regardless, this looks delicious!